How would you go about changing the font color of a caption in CRM? How would you go about changing the font color of a caption or field in Sage CRM? Below is a screen shot from my own system. This is the system that I use for testing ideas and proving concepts. The system has been integrated with a Sage BMS and the image below shows a customised opportunity summary screen. You can see that I have changed the oppo_description, oppo_source, and oppo_type fields. The changes to the display of the fields can be made to apply when the screen is in Edit mode. Note: You can of course decide exactly when the style changes apply - I only want to make the point that you can do what you want. The example can be pasted into the custom content box of OpportunityDetailBox screen. The job of the API is to make things as straight forward as possible for a developer and I think these methods allow pretty cool style changes to be made very simply. 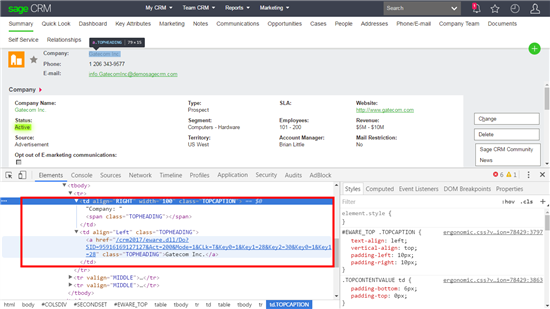 Handling fields in the TopContent area. The fields in the Top Content area are not tagged as fields in the same way they are in the main area of the screen. But they are marked in a way that you can find them. The screen shot above shows that I have opened up the developer tools in Chrome and I am inspecting the HTML. You can see that the caption is a 'td' with a class 'TOPCAPTION'. TopContent Fields added using the TopContent Screens. Additional fields can be added to the TopContent area using the various TopContent Screens e.g. If a field is added to the TopContent using one of these screens then the field is added to the HTML is a different way. The caption and data of the default fields (e.g. Company Name/comp_name) are added as a TD. The caption and data of the additional TopContent fields (e.g. Account Manager/comp_primaryuserid) are added as a SPAN. This means that you need to change the code slightly. 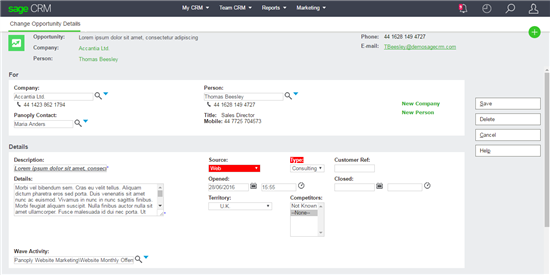 What if you need to change the font for all the fields on Screen in CRM 7? What version of Sage CRM are you using? Are you using cloud or on-premise? I've updated the article to include the information you wanted. Thanks for the script, Jeff. It will soon come pretty handy for me. For now, I'll just bookmark this for future reference. Great job. I don't seem to get mine to work, I have put the Account Manager field in the top content and in the CompanyBoxLong I have put in the following and it doesn't see to work. I've just updated the article to explain the slight difference in the way CompanyTopContent fields are added to the screen. Jeff: Is it possible to change how a workflow rule displays on the screen (font, color, bold?)? I would like the transition rule to stand out over the global rules. The next true step in my workflow is the transition rule - Submitted. All the remaining rules on the workflow are Global and are not required to move the workflow forward. I would like to make Submitted standout from the rest other than just placing it first. At the present time, I cannot think of how I can do this. Thanks! Based on the theory of what you were doing above (using custom content), I added this to the custom content area of my screen. I have been trying to get my head around different font colours for the workflow actions. How did you end up executing this? You can identify a button by the class 'WFBUTTON' and the individual workflow state by its id 'Button_Qualify'.